There are many situations when a USB to Ethernet adapter can be a very handy tool. For example, in some offices, you can discover that the Wi-Fi is disabled for security reasons and you really need to access the Internet. Maybe you’re gaming and Wi-Fi lag is having a disastrous effect on your gameplay. If your device lacks an Ethernet port, a simple adapter should do the trick in these situations and it can be the answer for other scenarios too. You might also be interested in our article about the best wireless adapter and the best cable modems. Not all adapters play well with every operating system out there. Make sure that your pick supports the onboard operating system of your device, especially if you use Mac or Linux. Also related to compatibility, it’s a good idea to check to see if you have any USB 3.0 adapters before going ahead and purchasing a USB 3.0 unit because otherwise, you won’t be able to experience the full speed potential. We all want the fastest network access we can get but spending more for capacity that you don’t use doesn’t seem ideal. If you access the Internet via a cable connection that can only reach a maximum speed of 25 Mbps, there’s no point in getting an expensive adapter capable of achieving 40 times that speed. As a general rule of thumb though, it’s recommended to select an adapter that goes over the maximum speed of your network. This is for taking into account future improvements. These are the main aspects regarding the purchasing decision for a USB to Ethernet adapter. If you don’t want to spend more than you have to and get the most value out of it, perhaps choosing a product from this list should be a tremendous help considering that they’ve all been selected with cost-effectiveness in mind. After careful consideration and in-depth reviewing, this is the final list. Check it out down below to solve your adapter needs once and for all. The Plugable USB3-E1000 is one of the best adapters for enjoying fast speeds during your gaming sessions or for all of your HD streaming needs. With a small size, this model is also the ideal travel companion if you own a laptop or a tablet. The price is extremely affordable for a USB to Ethernet adapter. As this unit supports USB 3.0, you should expect much faster speeds than USB 2.0 models. If you have a USB 3.0 port you will probably see at least a doubling of network speeds. This model has been thoroughly tested and verified in a special lab though ultimately, it all depends on the amount of bandwidth provided by your ISP. Equipped with a strong ASIX AX88179 chipset, this adapter offers fast 10/100/1000Mbit network speeds and the best compatibility with virtually all USB 3.0, 2.0, and 1.1 hosts. When it comes to operating systems, Plugable enabled this model to work with Windows 10 through XP though it won’t work with Windows RT and Windows Mobile systems like the Microsoft Surface for example, as these are ARM-based. There are drivers available to install for Mac users from OSX 10.6 and newer. Chrome OS is supported as well as Linux from kernels 3.9 and above. For those who need an adapter for their Nintendo Switch, this unit is a good solution as it works with its dock or with a compliant USB-C to A accessory in handheld mode. The performance on the Nintendo Switch is quite variable as the implementation is not optimal but despite that, the device is at least compatible so is still recommended. 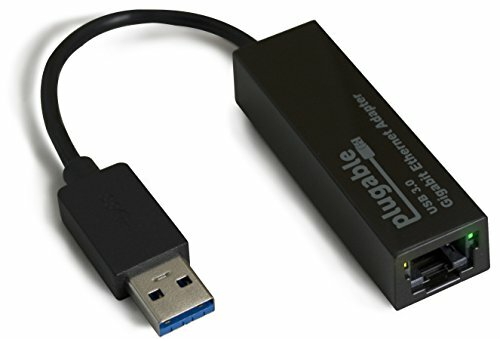 Considering that this model comes with a very quick install guide and all the drivers needed for Windows, Mac, and Linux, the Plugable USB3-E1000 is a solid choice for those who need a reliable USB to Ethernet network adapter. It delivers an improved speed compared to 10/100 adapters and most wireless networks and it can bring a wired gigabit network to lots of devices like MacBooks, UltraBooks, or any other model that lacks such a port. Cable Matters makes some of the best adapters in the industry and one of their most appreciated models is the 202023 USB 2.0 to 10/100 Ethernet network adapter. It doesn’t have USB 3.0 speeds but it’s affordable and does the job well and for most people, this is all that matters. Let’s take a closer look at its features. For transferring data, a wired connection gives you more peace of mind, and an adapter like this one can provide you with the means if you lack an Ethernet port. It will make a very stable network link for both gaming and streaming while also providing unauthorized wireless access. If you’re the type who enjoys a product that works quickly and in the simplest manner possible, you’re going to love this device. It’s fully plug-and-play which means that you plug the adapter into a USB port on your computer and that’s it. No need for downloading external software drivers, just sit back and enjoy your new wired connection. Compatibility is ensured for Windows, Mac OS X, Linux, and Chrome OS operating systems so it should most likely cover your system. To verify the network connection’s stability and data transfer status, Cable Matters integrated diagnostic LED indicators on the adapter. In terms of performance, you won’t disappointed by this little gadget as it supports WoL, HDX, FDX, backpressure routing, crossover detection, and auto-correction. As it’s lightweight, this network adapter represents a capable accessory that you should never forget to carry around with your Ultrabook or MacBook Air. There are lots of uses for a standard RJ45 port including HD video streaming, gaming, and video conferencing. If you want a reliable product without spending too much, the Cable Matters 202023 is an excellent choice. 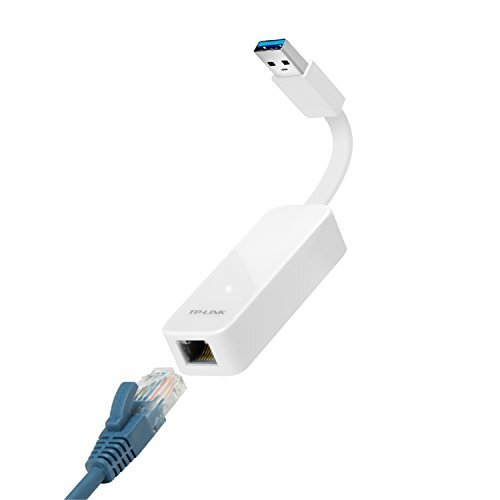 For any Mac owner that wants a stylish USB to Ethernet adapter, there’s no better option than the Anker AK-A7611011. With a gorgeous aluminum unibody, this device was designed to fit alongside your Macbook, Mac Pro/Mini, and iMac though it’s compatible with other computers too. The price is a bit higher but you get a sleek adapter which also delivers when it comes to performance. The design of this unit is the main attraction, there’s no arguing about it. It looks beautiful and many people probably don’t even care about its performance features as they’ve already decided to go with this one. The aluminum unibody isn’t just for show though, it can offer some nice protection and you can feel its sturdiness when you take it in your hand. The sleek aluminum alloy casing protects the device from damage when you repeatedly plug it in. It’s also incredibly compact and has a feather-like weight allowing you to slide it in and out of a pocket with ease. Anker built this model with the right balance of robustness and portability. It doesn’t disappoint when it comes to performance either. 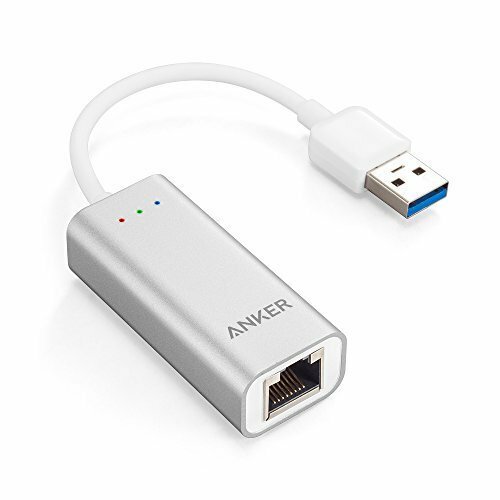 The adapter provides a quick and stable connection with theoretical speeds of up to 1Gbps. No more time wasted for pictures to load or videos to buffer. If you’re a gamer, you will definitely appreciate the boosted connectivity. Compatibility-wise, this model has been designed for Mac OS X 10.5 or higher, Windows Vista/7/8 but it works well with Windows 10 and Linux without additional drivers. If you like to keep it simple, you can’t go wrong with the Anker AK-A7611011. 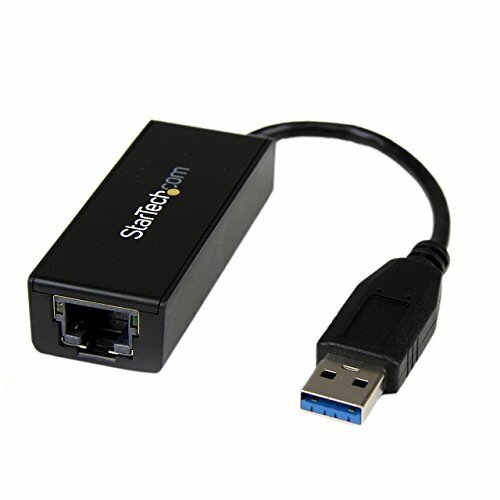 It’s stylish and delivers quality performance for everyone looking for a durable and compact Ethernet adapter. The price is a bit higher than the competition but if you want a more premium feel, it’s worth it in the end. Sometimes you just want to get down to the basics. There’s no point in spending too much on useless features or too little on a slow product with questionable reliability. 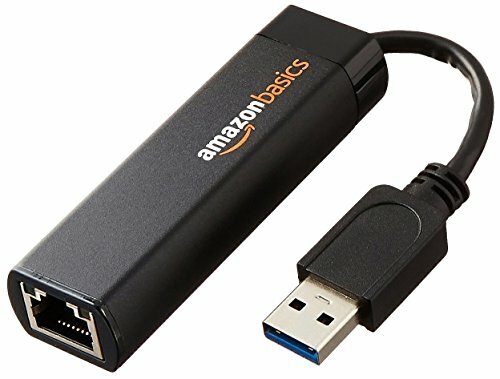 If getting the maximum for your money seems like a good idea, perhaps the AmazonBasics Ethernet adapter can be a great match for your needs. It brings the convenience of USB 3.0 speeds in a utilitarian, no-nonsense packaging. 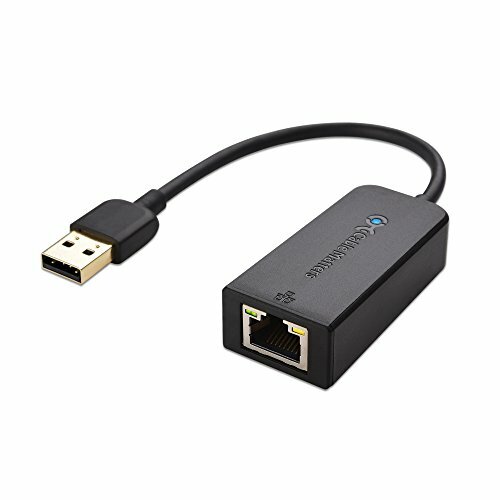 This device can be used for connecting a USB 3.0 computer or tablet to a router, network switch, or modem to provide Gigabit Ethernet for your network connection. It’s fully compatible with all Windows operating systems from XP to 10, Mac OSX from 10.6 and above as well as with Chrome OS with the latest system updates. There’s no support for Android or Windows RT but you wouldn’t expect that at this price. A very user-friendly model, this adapter can instantly bridge the gap and offer you a faster connection. Simply insert it into the USB port of your device and get the Ethernet cable on the other end and the connection is made. You’re good to go, and without having to install drivers or anything else. There could be some issues on Mac systems but to solve them, you just need to download the latest drivers. Among the supported features, there is Green Ethernet and Energy Efficient Ethernet, and Wake-on-LAN function. To reduce the CPU load, this adapter is equipped with support for IPv4/IPv6 pack Checksum Offload Engine (COE). Considering everything about the AmazonBasics Ethernet adapter, the final conclusion is a positive one. This is a reliable unit for faster data-transfer speeds as it adds wired network support for many devices but it can also serve as a replacement for a broken internal network card or if you would like to add a separate routable network interface. A great buy taking into account the price and its features. 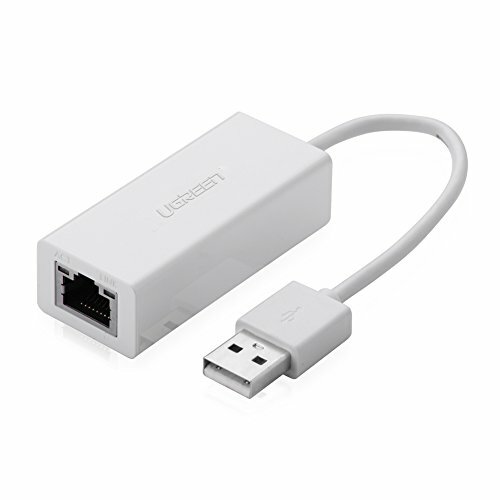 Another Ethernet adapter that can be considered as an option is the one from UGREEN. It’s a great unit for those on the budget who have no need for USB 3.0 but would prefer a reliable 10/100 Mbps Ethernet performance. This one can be a potential solution if you lack a standard RJ45 port on your notebook or ultrabook, especially considering its cost-effectiveness. There are lots of interesting performance abilities of this adapter. It supports Wake-on-LAN and Full-Duplex/Half-Duplex Ethernet. It works with Auto MDIX, backpressure routing, and crossover detection, and UGREEN offers support for IPv4/IPv6 protocols. It has an ASIX chipset which does its job well. Compatibility is an essential aspect for any USB to Ethernet adapter and this one seems to be one of the best in this regard. It’s not only compatible with all versions of Windows from XP to 10, Mac OSX from 10.6 to 10.12, Linux kernel 3.x/2.6 but it also plays well with Chrome OS, Wii, Wii U, and Nintendo Switch. Once again, Windows RT and Android are left out. This unit comes in three color variants, black, silver, and white and the manufacturer added some link and activity LEDs to monitor the network connection. Due to the fact that this is a plug-and-play adapter, it has all its drivers built-in so there is no additional installation required by the user. In case you want a solid alternative for the USB Ethernet adapter from Nintendo, this one works well for the Nintendo switch and at a much lower price. The design is smooth and everything else is great. Maybe this unit could have been more performant and support USB 3.0 but for those who don’t want to make the extra investment and only need it as an adapter, it works flawlessly right out of the box. The USB31000S from StarTech is a very capable adapter, focused on delivering the best performance for the money. It can be an ideal portable replacement network adapter and it can become an essential accessory for any laptop. The price is quite adequate for what it offers and this adapter should be a pleasing option for both home and business users alike due to its flexibility. One of the greatest features of this adapter is the built-in Checksum and Large Send Offload support which coupled with Jumbo Frames enables this unit to better conserve system resources. As it supports Gigabit networking over USB 3.0, you can expect high-speeds for all of your data transfer needs. More versatility is added by the VLAN tagging and WoL features which can be useful for those in business environments. For maximum portability, StarTech went with a lightweight design approach. The device looks quite conventional, nothing that stands out but there are Activity and Link LED indicators to monitor the status of your network. It’s clear that the true strength of this adapter lies in its performance abilities. The only thing left that’s worth discussing is regarding compatibility. It’s fully compatible with IEEE 802.3, 802.3u and 802.3ab and when it comes to operating systems, it plays well with Windows XP/Vista/7/8/10 and Mac OS 10.6 to 10.13. There is no support for VLAN tagging in Mac OS though so keep that in mind if you’re a Mac user. StarTech made this adapter compatible with Linux Kernel 2.6.25 to 4.11.x and Chrome OS 55+. With a wide range of applications, a practical design, and most importantly, offering an extreme level of performance for the price, the StarTech USB31000S shouldn’t be missed as it’s a strong candidate on the market for Ethernet adapters. This simple adapter has the potential to upgrade the connectivity of your ultrabook so that’s why it’s highly recommended. For those who want a little extra from their adapters or who are looking to solve two issues at once, an interesting combination of USB hub and an adapter like this on from Tecknet could be a good solution. 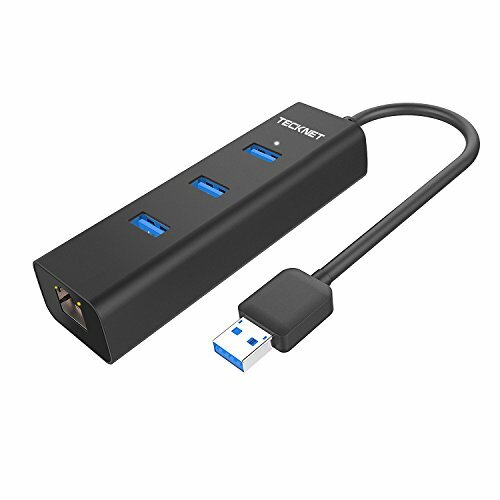 It instantly adds a Gigabit Ethernet port for all of your fast network needs, as well as three extra USB 3.0 ports to manage more devices connected and without making any compromises in terms of speed. This device has been designed specifically for those who use notebooks, ultrabooks, and tablets. They can often lack an RJ45 Ethernet port and you can run out of USB ports very quickly so this is an ideal accessory. It offers a quick and practical way to enjoy more possibilities as you can have a more stable wired connection and additional USB ports which will make the need to swap between devices a thing of the past. The cable of this model has a good length of 30 cm and the Ethernet port promises superfast wired network speeds which can theoretically reach 1Gbps. Thanks to its HU043 multi-protection design, potential damage to your connected devices is avoided whether you’re only charging them or transferring important data. To maintain a stable connection, it’s not recommended to use the hub with more demanding devices in terms of power consumption, such as certain external hard drives. This adapter is compatible with Windows XP to 10 and it works with the recent versions of Mac OS. If you want an adapter for Nintendo Switch, this is not the one as it doesn’t come with support for it so this can be considered a disadvantage although it’s a minor one. You can find concepts similar to this one on the market but this is a really well-made combination at this price. Why pay more for the same features if you can obtain them at a more affordable cost? This is basically what Tecknet had in mind when designing this product. It’s a small investment for such a handy accessory. TP-Link has gained quite a reputation in the WLAN products industry in recent times and one of their best models is the UE300, a foldable Ethernet adapter. It has pretty much all the features you could possibly wish for in a high-quality adapter but it does come with a considerably higher cost. If you have the budget and you’re willing to go the extra mile for such a device, then it’s worth checking out. The installing process for this model is very straightforward. It offers a driver-free, plug-and-play experience for Windows, Mac Linux, and Chrome OS though you will have to manually download and install the driver for Mac OSX 10.6-10.8. There are some good network dongle features supported, for those who work in business environments. The adapter supports WoL, HDX, and FDX, as well as Auto-Correction, Crossover Detection, and Backpressure Routing. To reduce some CPU loading, this model supports Checksum Offload and Segmentation Task-Offload. The latency is definitely much lower than a Wi-Fi connection. The design of this adapter is certainly interesting as TP-Link integrated a foldable cord design which, coupled with the ultra-compact form, makes the gadget more convenient for storage and travel. The only flaw of this model is that it doesn’t play well with Nintendo Switch, but other than that, this is a solid adapter. If you consider all its features of this sleek-looking Ethernet adapter, it’s safe to say that this represents a worthy investment. It works as expected and it can be a true lifesaver if your laptop only has Wi-Fi and the only connection available is a wired one. The foldable design is definitely a bonus for this adapter as it seems quite durable and reliable in the long-term.